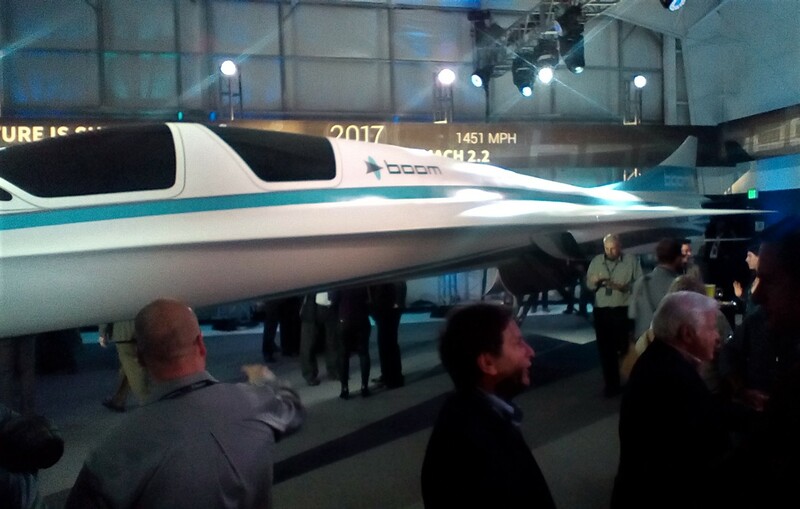 I was privileged to attend the roll-out of the Boom Aero technology demonstrator on Tuesday night in Denver. To give complete disclosure, we had some input early in the program just as Blake was getting started and we did some very preliminary layouts for the production version. In no way can we claim credit for any of the real progress made on the program, we were just lucky to be involved in a small way early on. All credit is due to Blake and his current team. Apologies for the quality of the picture for this article – I had my kindle fire in my pocket and had to make do with what I had to hand. I should have remembered my boy scout motto….. I really believe in the Boom operating model for the aircraft in service. I think they have that just right. I think the aircraft (the final production configuration) looks great and the technology demonstrator looks fabulous. I have personally worked for aircraft startups since 2001 and Abbott Aerospace has done 95% of our business on multiple aircraft startup programs since 2008. We have seen the good and the bad and no project has a monopoly of either. Harking back to previous posts on this subject (here and here), there are numerous financial pitfalls that the aircraft startup company faces. I believe that Boom has a market and their product is very well tuned to meet that market – they have defined their product and have a commercial argument better than the competition. Boom’s problem is how to get there without getting themselves and their investors into serious financial problems. There are several relevant data points in terms of development costs – the Boeing 787 cost between $15Bn and $30Bn (depending on your source material) to develop and bring into volume production. The G650 took around $1Bn (it was probably more, but that is the published figure). It is worth noting that the G650 traded on a lot of the previous aircraft technology from Gulfstream while the 787 was a wholly new composite venture for Boeing. However, both Boeing and Gulfstream had an established an organization, infrastructure and engineering and process/quality systems that they could use. They also had existing facilities and engineering teams not to mention global MRO and spares and repairs capability. Setting up the organization from scratch, going supersonic, convincing the FAA (and overseas certification agencies) that you should be allowed to operate your aircraft, steering the company and the aircraft through the first few months or years of inevitable teething problems in service are all eye-wateringly expensive. A startup company has to develop all of these aspects from the ground up and these are often the most underestimated aspects of the complete development. You must cover not only the engineering product but the means to manufacture it per the type certificate and keep your customers happy once the aircraft is in service. The startup company has to develop (and pay for) all of these things. In the case of Boom considering their overall development cost, it would be better to purchase an existing suitable company. Lear, for example, are ripe for the picking and they would acquire floor space, an entire set of company engineering and build processes, an engineering team and a global spares and repairs operation. It would be much more economic to purchase an existing operation and adapt it to meet the needs of your program than it would be to invest in setting up all of these things. Boom has a good chance of success. Their product has a market, they have some very good people involved and they have a self-confessed ‘zealot’ leading the charge. My fear is that they will not temper their blue-sky thinking with enough earthy pragmatism. But then again what do I know? In the end failure only shows us how to do it wrong. I sincerely hope Blake, his investors and his team are all successful in their aspirations and usher in a new golden age of both aircraft development and air travel. We could do with both. How lucky of you to have been there Richard. I have been following this for years and discussing amongst my own group a lot this week. You talk a lot of sense and particularly your idea of taking over and merging with Lear genius, especially considering their pre-existing (hard won!) experience of qualifying new technology (read composites). With the existing Lear development and qualification organisation, combined with an MRO system they would make a perfect fit for a startup program, and even the name association is good with Lear still retaining a link to advance technology aerospace. I am extremely curious about the huge claims made wrt engine technology however. Current engines have recently become much more fuel efficient, both in terms of consumption and emissions, but they run compressed input air using geared turbo fans. For supersonic flight the opposite is the case – too much input air needs to be throttled, and in the past afterburners were needed, dumping fuel into the combustors and burning very inefficiently = emissions. The claims are all around the propulsion. Actually designing and building a supersonic structure and control system is highly interesting, but all the technology does exist. I have seen nothing in the BOOM releases for this aspect of the design other than the claims; did they even identify the engine manufacturer (for the FSD) at the rollout? GE? I am fascinated by this program, the first time in some years there has been a truly exciting development in passenger aircraft. In fact it would be quite a good program to work on!. I hope you and your team get the opportunity to get more involved bringing the full scale development aircraft to EIS. Good luck to the BOOM Team, I really hope you are successful! The engine is the key – they did not give much information on the engine – it is key. I am not sure that the engine technology does currently exist quite how they want it. There are military engines but they are noisy and are not really made to cruise for hours at supersonic speeds. If they would buy another existing aircraft company it would help avoid the post-certification nose dive (Swearingen, Eclipse, etc) and they may even be able to generate a revenue stream along the way. It could also prove to be a distraction. It would take a major investor to come along, buy Lear and take a controlling stake in Boom and maybe manage them a two separate but allied entities. It will take a lot of $$ to do that – I am not sure that person exists. Aerion, the other ‘credible’ supersonic aircraft program, have partnered with Airbus so if they make it to market they will have the advantage of the airbus global network for sales and service. I wish Boom every success as well – at least they have a vision and have committed to it. I also have a really cool scale model of the production version that they gave everyone who attended. They have me won-over…….